Paul Saunders begins his 650-page history of Nelson County, Virginia, with this quote from Peter Jennings. And with a newsman’s eye for the story, Saunders covers his topic with numerous outstanding photographs and engaging interviews with people who have lived in, worked in, and helped to build Nelson County. Saunders says the quote inspired him to begin writing in 2000. He in turn inspired a “team” of Nelson County natives and researchers to accompany him on a seven-year journey documenting the story of their beloved home county. 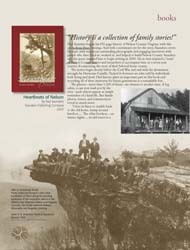 The stories begin shortly before the Civil War and end with the devastation wrought by Hurricane Camille. Packed in-between are tales told by individuals both living and dead. Oral history plays an important part in this book and recording all of these memories for future generations is a remarkable feat.